Welcome to Villas of Seacrest Beach Florida! This condo complex is located in Watersound Beach. These condos come equipped with all the amenities you could ask for while on vacation such as flat screen TV's, free wifi, kitchen with updated appliances, a balcony with a view, and more! The complex also has the largest outdoor pool in all of south walton! With a pool this big it will never feel over crowded. You can also take advantage of the bicycle rental service onsite and go for a ride on one of the community bike paths nearby. The beach is a short walk from the complex, but you can also take advantage of the free shuttle service that can take you to and from the beach at your convenience! 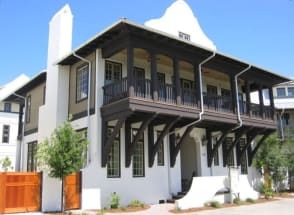 You can explore Seacrest and the neighboring communities such as Rosemary beach and Alys beach on your rental bicycle! Other attractions in the area include paddle boating on Camp Creek Lake, exploring Deer lake State Park and Point Washington State Forest, and enjoying the many local shops and restaurants! There is truly something for everyone here in Seacrest Beach, Florida. Browse our selection of rental properties available for rent at Villas of Seacrest Beach below. Contact the property owners directly by clicking the "Email Owner" button found on each listing, they will get back to you and gladly assist you in the booking process. ECBYO does not charge you any service fees when you book with us!